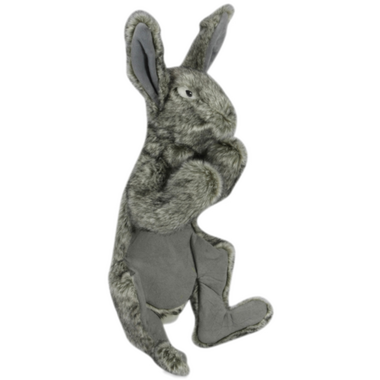 Realistic fur and under-stuffed body make for ease of play, carrying and toss-ability with this Hugglehounds toy. Each Rabbit has two squeakers. 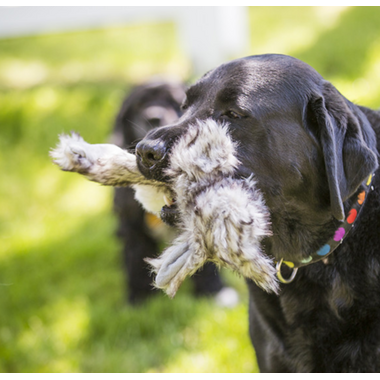 Groundbreaking Tuffut Technology® makes HuggleHounds® dog toys the strongest and most durable plush dog toys produced. The top layer of HuggleHounds toys are designed for maximum appeal, with fresh colors and interesting textures and fun, original designs. Cushioning protection makes the toys easy to wash, and quick drying. Hugglehounds are also made with safety in mind. Toys have details embroidered on so that they’re not easily removed, and each toy is inspected before shipping to ensure the highest standards have been met. Dimensions: 3 x 15 x 5.5"